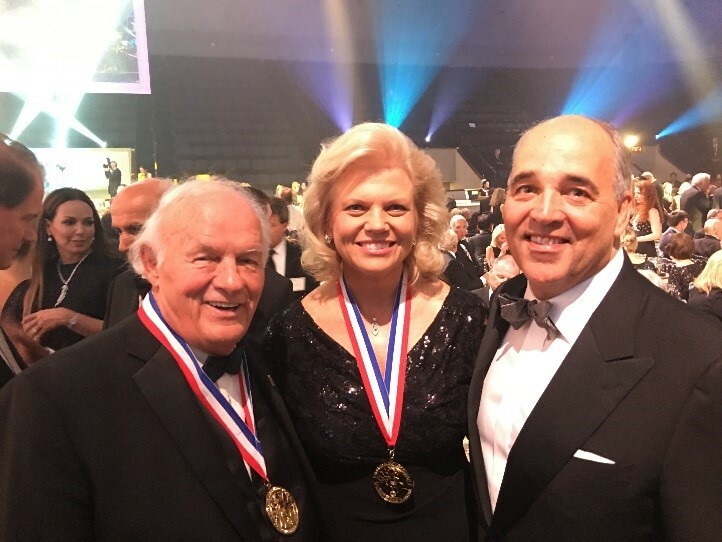 Dr. Cunningham with Denny Sanford and IBM CEO Ginni Rometty, who were honored with the Horatio Alger Award in Washington, D.C. The National University System (NUS), a network of nonprofit K-12 and higher education institutions, is dedicated to working with others to identify more opportunities that make quality education accessible to lifelong learners. Recently, Denny Sanford, who gave $28 million donation to NUS last year, made a generous donation to the Horatio Alger-Denny Sanford Scholarship Program. Through this gift, National University, the anchor institution of NUS, will be receiving $2.5 million in student scholarships, which equates to 250 annual scholarships to students who have, despite significant hardship, achieved success in high school, nonprofits and/or athletics. We are very thankful to Denny for his ongoing support of our mission to positively transform and impact the next generation of students through world-class education programs. Diversity is a key value of the National University System, reflected in our board membership, presidential leadership, faculty, staff and students. 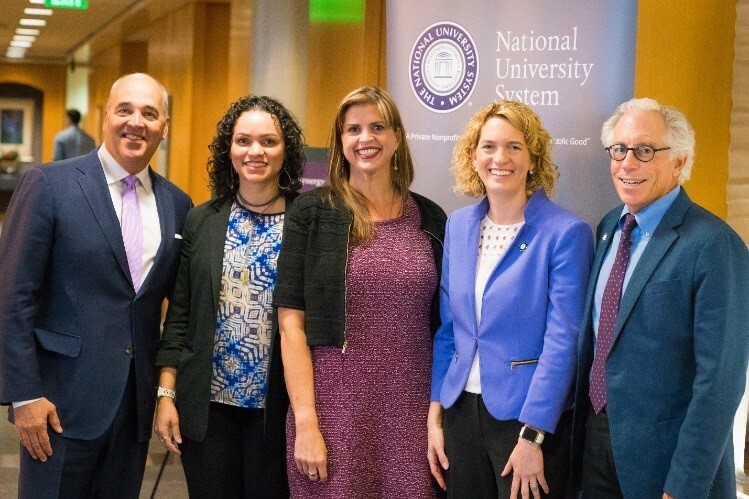 To address a need for greater gender equality in organizational leadership roles across the U.S., National University System launched the Institute for Leadership Synergy. The Institute emphasizes the inclusion of women and men working together to create more collaborative workplace cultures that value and find strength in diversity. Visit the KUSI News website to see highlights from the launch. I’d like to give special thanks to the wonderful leadership team that dedicated so much to the development of the Institute. We are deeply saddened by the sudden passing of Institute co-founder Will Marré. He was a fearless advocate for a more inclusive world and we are dedicated to carrying on Will’s legacy by empowering women and men to work together more effectively to create a better future. We send our deepest sympathies to his family. Chancellor Cunningham with co-founders of the Institute for Leadership Synergy: Dr. Roxanne Kymaani, Adriana Cabré, Joylyn Darnell & Will Marré. The Institute for Leadership Synergy is a natural progression of the National University System’s PreK-6 Sanford Harmony social emotional learning program, which was inspired by Denny Sanford to strengthen relationships and increase understanding among children into adulthood. NUS is collaborating with other universities, including National University and City University of Seattle (CityU) to expand the program to more than 1 million students nationwide, who represent our future workforce and leaders. More businesses are seeking employees who have demonstrated strong social emotional learning skills for more collaborative and effective outcomes. In this way, Sanford Harmony’s focus on strengthening positive peer relationships among children aligns clearly with the goals of our new Institute. In January, City University of Seattle and the Puget Sound Business Journal co-hosted a workshop focused on best practices in recruiting and retaining great employees. The workshop, which hosted human resources professionals from throughout the northwest, aligns closely with several key values that are central to NUS. That includes our focus on workforce development, collaborations and partnerships. “Talent Quest 2018” showcased a panel of experts including: Rebecca Henderson CEO, Randstad Sourceright, who also serves as Chair of NU Board of Trustees; CityU President Randy Frisch; and prominent business leaders from organizations such as Microsoft, Cisco, Tom Douglas restaurants and cybersecurity firm IOActive. This event also provided an excellent opportunity for industry professionals to learn about the benefits of an education relationship with our universities. I’d like to thank the entire NUS community for your unwavering commitment to fostering a collaborative, inclusive education environment that focuses on positively transforming and impacting our students, workplaces and greater society.